BRITAIN has not ruled out calling for an independent tribunal to settle the Brexit divorce bill, sources said last night. 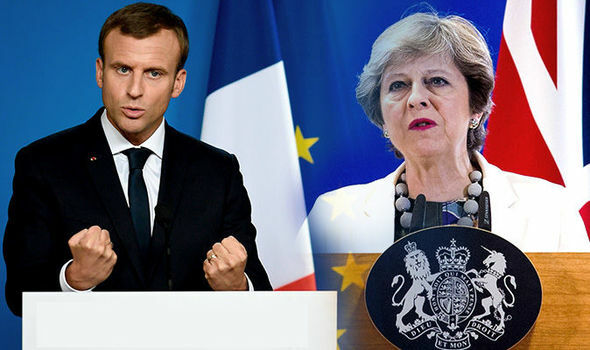 It came after French President Emmanuel Macron dismissed an unofficial offer of £20billion by Theresa May during last week’s summit, claiming “we are not halfway there”. It is understood the EU has pegged Britain’s obligations to at least £60billion. Last night sources close to Brexit Secretary David Davis said they were viewing the option of convening an ad-hoc tribunal as a way to break the log-jam and move on to trade talks. The idea was backed by Professor David Collins, an international law expert, who said the financial settlement issue could be resolved within “one to two months” of a tribunal convening. A classic example is the Iran-US Claims Tribunal, established in 1981. It has resolved 3,900 financial claims by both nations over the 1979 embassy hostage crisis. Brussels, too, already uses similar methods in resolving trade issues with global trading partners such as Vietnam and Canada. “There is an argument that the International Court of Justice at The Hague would not have jurisdiction over this, because it deals with issues between states, and the EU is not a state,” said Professor Collins, of London University’s City Law School. Professor Collins said it would require an odd number of judges, probably three: one British, one from the EU and a third from a neutral country. If there was difficulty in reaching an agreement over the third judge, he or she could be appointed by the International Court of Justice. The Brexit tribunal would “probably be held in Brussels”, he said. In March, analysis by the Brussels-based Bruegel think-tank found the UK could owe the EU as little as £21billion. However, it also said it could be substantially higher. One controversial sticking point is a £6billion demand by Brussels to fund the pensions of retired EU officials. At a summit meeting last week, it took the 27 EU leaders just 90 seconds to agree on a statement in which they ruled that insufficient progress had been made over the three key withdrawal issues: citizens’ rights, the Irish border and the financial settlement. Professor Collins said: “Clearly, the fault for the slow pace lies with the EU. It is being strategic and opportunistic over what it sees as disunity at the heart of Government. 0 Response to "Britain could take EU to COURT over Brexit divorce bill to expose 'INFLATED' cash demands"